Bright and airy bedroom with room to read and relax. Comfy bed after a hard days' vacationing. A bright and fun room to sleep and hang out. 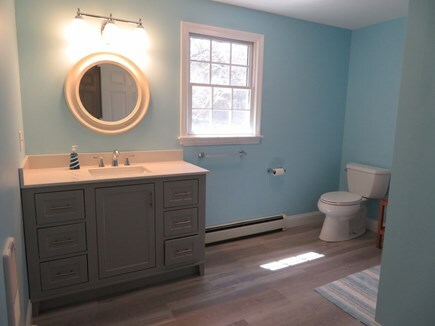 Beautifully renovated bright and airy first floor bathroom. Ready for your beach towels! Peaceful Boat Meadow Marsh alongside the house. New outdoor shower, and Weber grill on the deck. Come and stay in our newly listed, spacious Cape, just under a mile from Boat Meadow and Dyer Prince Beaches on the bay side of Eastham. Nestled in a hidden gem of neighborhood along Boat Meadow Marsh, the cul-de-sac location makes it safe for kids to play in the yard and ride their bikes, and is a perfect place to rest and relax and really feel like you're getting away from it all. 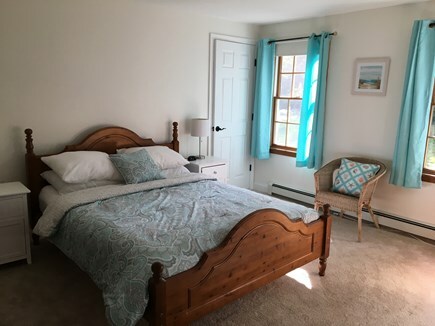 This unique location boasts the best of both worlds; it is quiet and peaceful, yet only 3 minutes' drive from the shops and restaurants of Orleans, and within 10 minutes of First Encounter and other favorite bay side beaches. 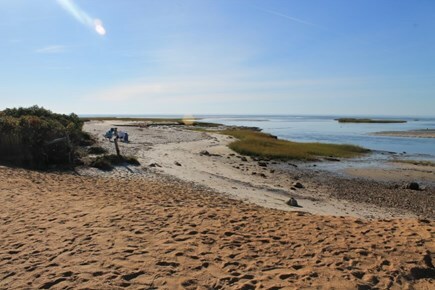 Take your morning stroll down to the Eastham side of Rock Harbor and watch the fishing boats coming and going. Don't forget to soak up the magnificent sunsets at the beach or across the marsh. The Cape Cod rail trail is only half a mile away offering 22 miles of paved trail perfect for bikers, runners, walkers of all ages. We realized our dream to have a Cape Cod oasis of our own in 2017 when we purchased this lovely 2000 sq ft family home. Since then we have been hard at work renovating, refreshing, and making it a marsh side sanctuary that we cannot wait to share. The layout of the house is a perfect design for groups to gather or for individuals to find their own space for some quiet privacy. The spacious living/dining room gleams with new oak hardwood flooring and fresh paint and is a great place to gather for conversation or curl up on comfy chairs to read a magazine or just snooze! Families can gather round the dining table that extends to accommodate guests, and enjoy memorable family meals. New French doors lead into the large, airy sunroom with its cathedral ceiling. It is a great place to watch TV or dvd's, play some of the many board games, and enjoy the view of the marsh through the pines. Summer breezes and ceiling fans keep you cool as you observe the Ospreys and wildlife on the marsh, or step out the sliding doors onto the deck for dinner and a cocktail as you watch your grill master work their magic on the Weber Genesis grill! The house was built to a family's design, which makes accommodations ideal for multiple generations or family groups. 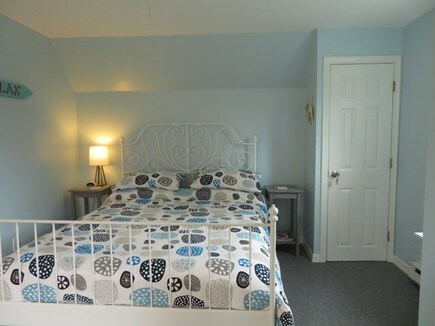 The newly painted first floor bedroom has a Queen bed and is next to a large full bathroom with shower/tub combo which boasts fresh paint and new floors and vanity! 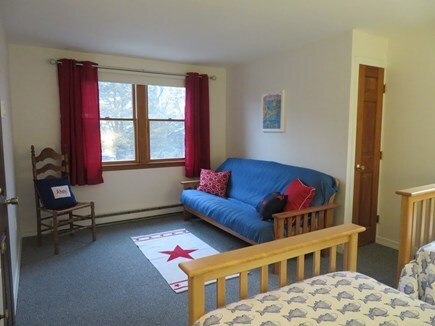 It also provides easy access to the kitchen; this room might work for adults who want their own quiet space, or maybe grandparents or individuals who prefer not to climb stairs. The second floor has a newly renovated full bathroom with shower/tub combo. The two 2nd floor bedrooms are freshly painted, and all mattresses and bedding throughout are brand new. The Queen room is calm and a great place to rest after a hard day's beaching or biking! The other room contains 2 twins and an additional full size futon for an extra guest with plenty of room to play and rest. Cook up a feast in the fully equipped kitchen, or sit a while at the new breakfast counter as you sip your morning coffee. A washer and dryer are located in the newly renovated mudroom with plenty of space to hang your gear. The house is equipped with smart tv's and high speed wi-fi, and has plenty of books and games for adults and kids. Window a/c units are provided in all bedrooms and the living/dining room. 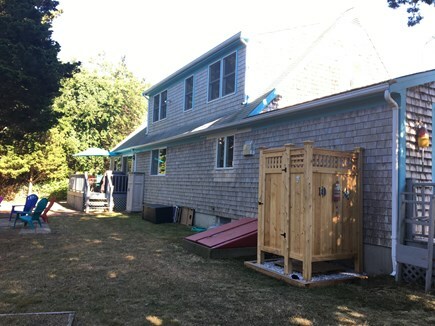 A brand new outdoor shower has just been installed! Renters provide own linens and towels. No smoking permitted on the property. No pets allowed, but renters should be aware that the owner's small dog has been in the house on occasion. First floor queen bed adjacent to large full bathroom. Three steps from outside into the house at all entrances. 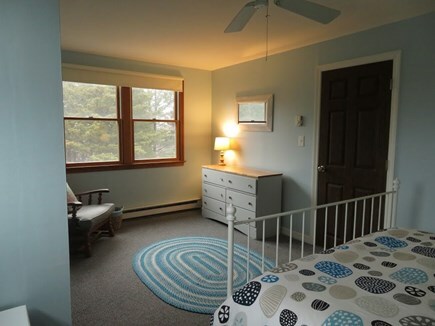 In over twenty years of vacationing in Eastham and attempting to find the perfect vacation rental for our family of five, Jo and Andy’s home has attained this status with the rating of “the best home ever”. This convenient yet private location (just around the Orleans rotary), multiple, comfortable living spaces (my personal favorite, the fantastic sunroom), well- appointed bedrooms (outfitted with high end mattresses, pads and coverlets), private backyard bordered by the marsh (beautiful vistas supplementing hours of corn hole competition), extraordinarily well-stocked home (three types of coffee makers, plates and service-ware to feed an army, and ample supply of beach gear to name just three of countless examples), offering QUIET SOLITUDE presented the perfect vacation rental for us. No detail had been overlooked as evidenced by the thoughtfully compiled local area information (new discoveries for our seasoned family) and background history and renovation of this Cape Cod vacation home. The owners provided us with a true “home away from home” and we are quite appreciative of their gracious and accommodating spirit. We hope and plan to return annually for the foreseeable future as we don’t need to look anywhere else for “the perfect vacation rental”! First time we have stayed on Cape Cod. Had a lovely holiday. Beautiful House. Very Clean. Easily accessible, near to beaches, lovely surroundings, nice quiet location. Would definitely stay here again. Highly Recommend.